The Original recipe for donuts as made by the Salvation Army Lassies in WWI. Why not try them as a fundraiser for your corps? Put flour in shallow pan, add salt, baking powder, and Sugar. Add the well beaten egg and milk and stir thoroughly. Toss on floured board, roll to one-fourth inch in thickness, shape, fry, and drain. Nowhere does it say what to do with the cinnamon and nutmeg. 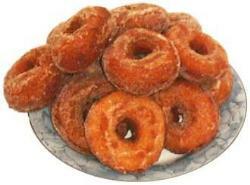 When I made them I mixed it with super fine (caster) sugar and used it to 'dust' the donuts with after they were cooked. Much to my surprise these turned out very well and tasted pretty good!! A little on the heavy side perhaps, but there were none left a day later! Note: I have had some comments regarding this recipe concerning the amount of butter - or rather the lack of it! :-) To save any confusion, no, this is not a typo on my part. Butter was a scarce commodity during WWI and therefore they used what they had, in this case not a lot! Believe me, the recipe does work and the picture above is of the donuts I made by following the above recipe. According to George Scott Railton, the original Skeleton Army was organised at Weston-super-Mare, towards the end of 1881. The Christmas War Cry of that year states that 'the chief officers of the Skeleton Army raised to oppose us at Exeter were converted'. It was after that edition that the term Skeleton Army came into continual use. A lurid light was thrown on the origin and purpose of the organised opposition by an article which appeared in the 'Bethnal Green Eastern Post' (November 1882). Amongst the skeleton rabble there is a large percentage of the most consummate loafers and unmitigated blackguards London can produce...worthy of the disreputable class of publicans who hate the London school board, education and temperance, and who, seeing the beginning of the end of their immoral trafic, and prepared for the most desperate enterprise. The skeleton armies carried flags usually bearing a skull and crossbones, no doubt inspired by the prominence given to piracy in contemporary "penny dreadfuls" for boys. Variations included the addition of two coffins and the motto "blood and thunder ! Others decorated theirs with monkeys, a devil, and rats. Another had a yellow banner with three B's-" beef beer and 'bacca ! Some of these " armies " produced "gazettes" - ribald, obscene, blasphemous and slanderous! Ammunition was flour, red and yellow ochre, rotten eggs, stones, brickbats and any other unpleasant and often at times injurious missiles that might be found at hand. Sticks were often used viciously on men and women, young and old alike. The organization of skeleton armies in London and the publicity this received did much to spread trouble throughout the country. At first the Metropolitan Police turned a deaf ear to the appeals made for protection for Salvationists. Their then head (Sir Edmund V. Henderson) even denied the existence of what was alleged to be taking place. Serious fighting and conflicts with the police eventually turned the public against the Skeleton Army in London, resulting in drastic measures being introduced to deal with the rowdies, bringing organised trouble to an end. The Skeleton Army however, thrived in other parts of the country until 1892. During those years the corps officer's wife at Guildford was kicked into insensibility, not ten yards from the police station, a woman soldier was so injured that she died within a week, At Shoreham, a woman captain died through being hit by a flying stone. Eastbourne's mayor declared that it was his intention to 'put down this Salvation Army business', and if necessary the town council would call on the Skeleton Army to help them. This in fact happened, and many Salvationist were brutally assulted because they were denied the protection of the law and would not protect themselves. It was the universal testimony, in which even their bitterest enemies sometimes unwittingly joined, that Salvationists not only did nothing that provided the slightest excuse for bad treatment but at all times showed a truly Christian forbearance. Having proved how useful musical instruments were in attracting crowds to open air meetings, William Booth, in the War Cry dated 27th March 1880, stated his wish that as many officers and soldiers as possible should learn to play instruments. The musicians of those days were not as proficient as might have been wished, but a great variety of instruments were pressed into service. The War Cry of 17th February 1881 carried a picture of "Miriam, a Forerunner of the Prophetess of The Salvation Army" with timbrel in hand. Up to this time nobody in The Salvation Army had ventured to beat a tambourine, but the picture inspired Captain Charles Rothwell who was stationed at Mansfield, Nottingham. Seeing a tambourine in a pawnbrokers shop he lost no time in buying it, and Mrs. Rothwell played it in the processions which "filled the devil with disgust, the newspapers with comments, the barracks with people and helped sinners into the fountain! When Mother Shepherd, accompanied by her two youngest daughters Polly and Sally, took charge of West Bromwich Corps in June 1881, soldiers and people alike took no notice of them. Sally, noticing her mothers distress, and having heard William Booth state that he would even wear a red coat for Jesus, turned her red lined white coat inside out and headed their small procession beating a tambourine with immediate effect. The use of the timbrel spread quickly. In the War Cry of 7th October 1882, George Scott-Railton noted that 1600 had been sold in the space of six weeks and warned the Army's timbrelists that they should not beat their tambourines without at the same time singing! When conducting meetings in Scotland, Catherine Booth boldly claimed that tambourines and fiddles were as sacred as organs. The General suggested that when tambourines were used, there should be something to balance them, "such as clappers, bones, fifes or banjos!" Nearly 120 years after the introduction of the timbrel into Salvation Army music the majority of Army Corps feature a Timbrel Brigade in their music sections, although now no one would ever suggest that the timbrelist lacks talent! It could be said that the Salvation Army Collecting Kettle was born out of necessity. In 1891, Captain Joseph McFee made a commitment to provide 1000 of San Francisco's poorest inhabitants with Christmas dinner. The problem was that he had no money with which to purchase the necessary food. He awoke early one morning with memories of his days as a soldier in Liverpool where he saw what was know as 'Simpson's Pot', a large stewing pot into which charitable donations were thrown by passers by. Captain McFee wasted not time in securing permission to place a similar pot at the Oakland ferry landing. A sign across the top urged people to 'Keep The Pot Boiling'. It was an instant success and the money needed to fund his commitment to provide 1000 Christmas dinners was soon collected. By Christmas 1895 the kettle was being used in around 30 Salvation Army corps of the West Coast area. The idea was spread to eastern U.S.A. by two Army officers, William McIntyre and N. Lewis, who took the idea with them when they were transferred. 1897 saw William McIntyre use the Collecting Kettle at the centre of his plans for Christmas collecting in Boston. His fellow officers were reluctant to cooperate for fear of being ridiculed. Undaunted by this lack of support, McIntyre, his wife and his sister set up three kettles on Washington Street in the city centre. That year in the U.S.A. over 150,000 Christmas dinners were provided for the needy thanks to the Collecting Kettle. In 1901, kettle contributions in New York City provided the funds for the first great Christmas dinner in Madison Square Garden, an event that continued for many years. Today however it is more usual for families to be given grocery vouchers so they can buy and prepare their own dinners. The homeless are still invited to share Christmas dinner and festivities at hundreds of Salvation Army corps and centres. From the creative mind of Captain Joseph McFee came an idea that has resulted in monies being raised to fund Christmas programmes not only in the U.S.A., but throughout the world. Kettles are now used in Japan, Korea, Chile, and in many European countries. The folded card on the left was produced by The Salvation Army in the U.S.A. in 1991 to commemorate the centenary of The Salvation Army's first kettle. It was printed from an original work titled 'The Salvation Army's First Kettle, 1891 by Chicago artist, Donald E. Lidstrom which depicts the scene at Oakland ferry landing, where Captain McFee set up his first kettle. The Junior Staff Band of The Salvation Army was commissioned on April 22nd 1889 under the direction of Bandmaster Samuel Webber. The new band consisted of office boys and junior clerks from International Headquarters in Queen Victoria Street. After having been in existence for about two years, most of the players were too old to be regarded as 'junior', and in October 1891 a memorandum from the Chief of the Staff brought into service the International Headquarters Staff Band. Staff Captain, Fred Fry was appointed to take charge of the newly formed band. 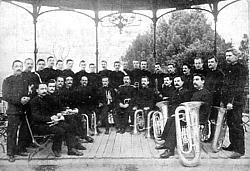 In September 1893 the band was reorganized, with Jabez Lyne becoming the first officially appointed bandmaster of the International Staff Band. His time with the baton did not last long however, and in 1894 Caleb Burgess, late of the Household Troops Band, took charge. He was succeeded later the same year by George Mitchell, who served as bandmaster until 1920. Upon Bandmaster Mitchell's retirement the band ceased to function for two years, due, in the main to the toll taken by the First World War. Reformed in 1923, with Major George Fuller, the new Bandmaster, the I.S.B's first engagement was at Bideford in Devon. Major Fuller had been a member of the band since 1891 and was Deputy Bandmaster for some 23 years. As part of the band's golden jubilee celebrations, the I.S.B. were, in October 1941, accorded the honour of playing in the forecourt of Buckingham Palace. In 1942 Major Fuller was presented with the Order of The Founder by The Chief of the Staff, Commissioner Alfred G. Cunningham, after serving in the position of 19 years. Major Eric Ball, a well known name in Salvation Army music circles took up the baton upon Major Fuller's retirement. On 31st August 1942 the I.S.B. broadcast under the baton of it's new bandmaster for the first time over the BBC Forces network. Major Ball left the I.S.B. in 1944, having resigned his commission as an officer of the Salvation Army. As a temporary measure, Lieutenant-Colonel Bramwell Coles was asked to conduct the band for the remainder of that season. In September 1944 Brigadier William Stewart, an ex cornet soloist with the I.S.B., was appointed it's new bandmaster. 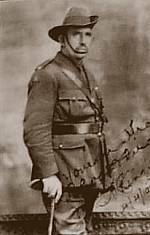 Two years later Brigadier Stewart asked to be relieved of the bandmastership and was succeeded in the position by Major Bernard Adams. Major Adams was to become the longest serving bandmaster of the International Staff Band, serving for some 28 years until his retirement in 1975. He led the band on many tours both in the United Kingdom and overseas, including the first visit to mainland Europe for 23 years when in 1949 the I.S.B campaigned in the Netherlands. The Band celebrated it's Diamond Jubilee in 1951 with around 85 former members attending a reception on Saturday October 15th, including 81 year old Colonel Alfred Hamilton, the I.S.B. 's first flag officer. The climax of the celebrations was the Monday evening festival in the Royal Festival Hall, presided over by General Albert Orsborn before an audience of some 3,000. Eight days later the band were again playing by Royal command in the Forecourt of Buckingham Palace. Upon his retirement in 1975, Colonel Bernard Adams was admitted to The Order Of The Founder by General Clarence Wiseman. Major Ray Bowes was appointed to be Colonel Adams successor as bandmaster of the I.S.B. The following year Major Bowes celebrated 25 years as bandmaster at Harlesden Corps. He was to conduct the I.S.B. at Westminster Abbey for the Commonwealth Day Service held in the presence of Her Majesty The Queen and The Duke of Edinburgh. In 1976 the I.S.B. attended the Army's Holiday Plus Fellowship Camp at Butlins, Bognor Regis, for the first time playing to over 4,000 guests. To date there have been two other bandmasters of the International Staff Band, Major Robert Redhead, and the present incumbent, Bandmaster Stephen Cobb. The Army's premier band has now given nearly 110 years, 78 years of that unbroken, carrying the message of Salvation to the world through its' music. Long may their unique way of spreading the word of God continue. For further reading we recommend what is perhaps the definitive history of the International Staff Band. 'I.S.B. The Story Of The International Staff Band' by Colonel Brindley Boon. There was initially only one station at St. Albans (later named St. Albans London Road) with further intermediate stations opening at Srnallford in 1866, Sanders Siding (later Salvation Army Halt) in 1897, Hill End in 1899, East Hyde in 1910 and Lemsford Road in 1942. Salvation Army Halt: On the southern outskirts of St. Albans a private business of orchid growing was established by Messrs. Sander & Sons. Their greenhouses were linked by a siding for the dispatch of orchids to market. The siding was also later used for the carriage of straw hats from Luton to London. A sleeper built platform halt was built for the use of Sander's staff This was later also used by personnel from the Salvation Army's Campfield printing works. From the siding, Salvation Army periodicals were sent in large quantities for distribution around the world. The station was opened as a Sanders Sidings as a private non time tabled halt by 1st November 1897 first appearing in a public timetable on 8th July 1929. It last appeared in the public timetable in September 1942 although it remained in use until the closure of the fine in 195 1. 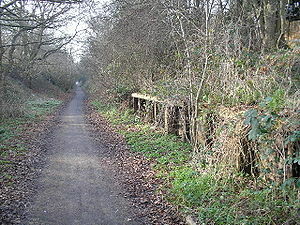 The siding remained in use until December 1964. 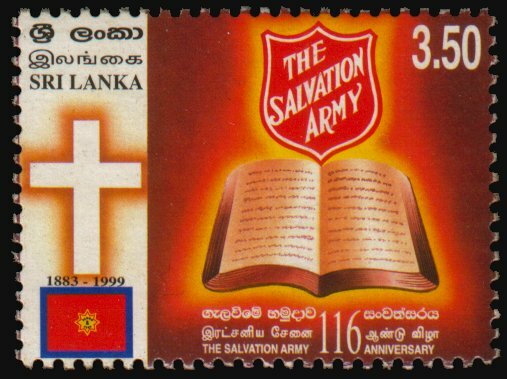 Why did Sri Lanka issue a stamp for the 116th anniversary of the Salvation Army in that country? The stamp’s designer, Major Daryl Crowden, explains. This stamp was designed at The Salvation Army Headquarters in Colombo Sri Lanka by myself, in my position as Territorial Public Relations Secretary, and the Youth Secretary, Captain Nihal Het-tiarachchi, with ultimate approval of the Territorial Commander, Colonel Keith Wylie. One of our Salvation Army Officers (Captain Subasinghe) was friendly with the Sri Lankan Postal Agency management and approached them about the possibility of issuing a stamp as part of a public awareness program that was to coincide with the visit of General Radar (R) in 1999 (which explains the unusualness of issuing a stamp not coinciding with an anniversary). However, the stamp ended up bearing no image, or relationship with the General’s visit as the decision was made that it should be more generic so as to "outlast" the once-off event. Given that Sri Lanka is essentially a Buddhist and Hindu culture, it was decided that the stamp should display both recognisable Christian symbols (the Cross and the Bible) and the internationally recognised Red Shield. The Salvation Army is very well known and accepted in Sri Lanka for it's welfare and community ministries but we wanted to focus attention on the reason for the ministry — our faith in Jesus. The stamp was designed in MS Publisher and was therefore extremely basic when submitted to the Postal Agency. It was their artists that embellished the image with the yellow (Bible and Shield) and brown (Cross) halo effect. The Salvation Army had very little to do with the First Day Cover. 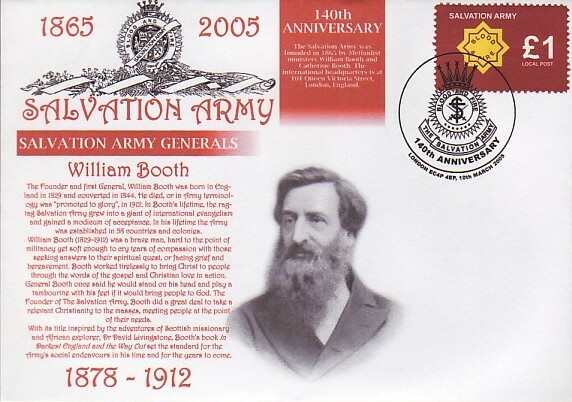 It was a later addition, requested by the Postal Agency and the image of William Booth (Co-Founder of The Salvation Army) was requested, and all artwork for this was completed by the Postal Service. The First Day Cover (and some stamps) were sold from The Salvation Army's Trade Store, located in Territorial Headquarters, at 53 Sir James Peiris Mawatha, Cohimbo 2. As members will know, we like to make public rare Salvation Army letters and this is a lovely example from the Founder. In his usual forthright style and even at an advanced age, he is seeking to make use of contacts. 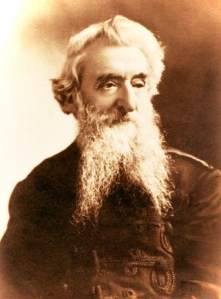 William Booth was clearly interested in seeking information about Russia and although promoted to Glory when the work did commence there in 1913, had laid the foundations for it. 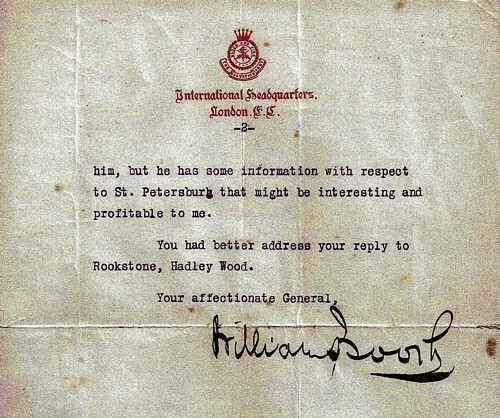 Like any Army, good intelligence was important to Booth - there was of course an intelligence department (as well as a coded and confidential telegraph book)! There seem to be an increasing number of personalized stamps with Salvation Army images appearing on the market. These, in the main, emanate from the Netherlands. I find this trend a little worrying as theoretically there is no limit to the number of designs that can be produced. Add to this the fact that these stamps are being sold at a considerable premium above cost, let alone face value, and the result could be that collectors will pay very high prices for stamps that will never gain major catalogue recognition. The only motive that I can see in producing these stamps is profit, and while I agree that honest profit is not a bad thing, I am afraid that I cannot agree that these issues are of any benefit to the collector. Whilst I am sure that there is no intent to deceive on the part of those producing these stamps, what happens when they are sold on? The potential for collectors to be deceived into thinking that these are produced by the postal authority as a special issue no doubt exists. The copyright issue is one for the postal authorities that are actually printing these stamps. It beggars belief that they apparently make no attempt to verify that the customer ordering these ‘stamps’ has a legal right to use the images. Surely this must mean that the relevant postal authority is leaving themselves open to actions for breach of copyright. I have reason to believe that there are now around 70 plus of these Netherlands "stamps" produced. This has only strengthened my belief that they are being put on the market purely to make profit from uninformed collectors. 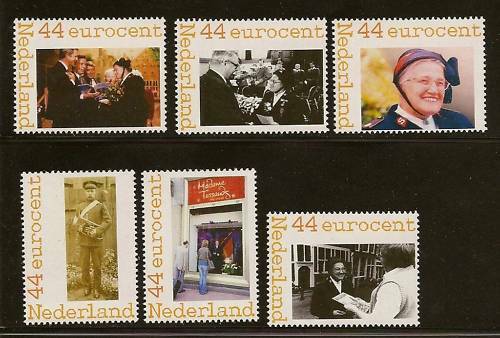 They are not official issues of the Dutch Postal Authority, but they are valid for postage. To whoever is having these printed please stop!!!!!!! 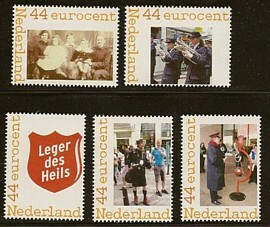 You are doing nothing but harm to Salvation Army philately. I was sent a link to the cover pictured left by a friend of mine in Australia. 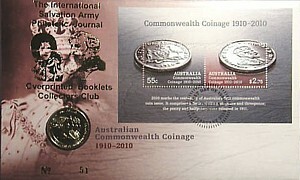 As you can see it is an overprint on the Australian Commonwealth Coinage 1910-2010 FDC. I have ascertained that the Salvation Army images were added to the existing FDC. That is they do not form part of the original cover. It therefore seems reasonable to assume that the SA images were added in order to increase the value of the cover and to make it of interest to SA collectors. My personal view is that all the overprinting has achieved is to deface the original cover. Furthermore the addition of the SA images most certainly does not result in an SA related cover. The production of such items fills me with horror as theoretically it is possible to overprint any cover in this manner in order to produce a supposed SA related item. The mind boggles! I wonder too about the knowledge of whoever overprinted these covers as they claim that the images show the SA Founders. Upon close inspection the images are actually of William Booth and his daughter Evangeline. Whoops! Is this cover a deliberate attempt to deceive? Probably not. It is not however an original FDC and I am sure that there are collectors who will be deceived into thinking that this cover is totally original. To produce an original SA cover is not that difficult. All that is required is a purpose and a little imagination. In my humble opinion the production of covers such as the one below can do SA philately nothing but harm. The booklet left has been overprinted in a similar manner. 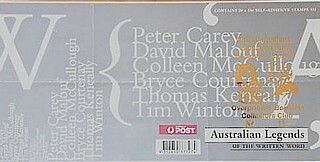 Although overprinting Australia Post booklets in this way seems quite common in Australia, it is likely that the same person is responsible for all the overprinted booklets I have seen. After checking retails with Royal Mail I can confirm that such a practice is illegal in the UK as it is against the law to deface any Royal Mail product, let alone then offer that product for sale at a premium above face value. I have attempted to get a reply from Australia Post as to the legality of such overprints in Australia, but as yet I have not received a reply. It would seem to me that it is unlikely that Australia Post would approve of these overprints or that those overprinting these booklets have sought official permission to do so. It may be that the producers are batting on a very sticky wicket when it comes to these booklets. The purpose again appears to be to try to add value to the booklets by overprinting them with totally unrelated images. Here again the possibility that collectors will be deceived, albeit not deliberately, definitely exists. So are these overprinted items collectable? I suppose that only the individual collector can answer that question. My view is that while they may be of some interest as novelty items, paying over £30 for a defaced cover or over £16 for a defaced booklet containing barely £6 worth of stamps is certainly not my idea of collectable. New and original SA philatelic items are always welcomed by collectors. If required I can help with images, design, production, promotion and even sales. I will not however become involved with items such as these which to my mind are at best of questionable monetary value and, deliberately or not, are likely to deceive at least some collectors. Major John E.T. Milsaps was a complex, creative and curious man. A collector of books, manuscripts, pamphlets, tickets, posters and photographs. Born in Houston, Texas in 1852, his grandfather, Issac, was killed during the Battle of the Alamo. His father served with the Confederate Army, and as a child, Milsaps made bullets for the Civil War. Milsaps moved to California to seek his fortune in mining, and soon met up with The Salvation Army in 1883. His talents for writing were soon recognized and he became the editor of the San Francisco War Cry. The War Cry of that time was his total creation. Lively sketches and drawings are among the articles and photographs. Milsaps decorated his diaries with these same colourful and fanciful sketches and creative ways of lettering. The Major wrote to and knew all the leaders both in the US and the International Army. He was close to Booth family members, especially Emma and Frederick Booth-Tucker. Milsaps chose to remain loyal to the Booth family during the 1896 resignation of Ballington Booth. Milsaps was in the Headquarters building while Maud and Ballington were barred from the upstairs administrative officers. Milsaps was leery of Evangeline and felt she was involved in the Atwood letters of 1927-1929, which brought to light the “nepotism of Bramwell Booth and his children.” He was vocal in his support of the 1929 High Council, as he felt the family dynasty needed to end, and felt the favouritism toward Bramwell Booth’s children was a snub to all hardworking God-fearing officers. Although Milsaps disagreed with the cruel treatment Bramwell received, he did see the necessity in his removal as General. Major Milsaps saw Bramwell as a sick man who needed to retire for health reasons. He documented Army gossip and appointment changes in his diaries. Milsaps wrote daily in his diaries (1852-1930). Each day, the weather, local and international news were recorded, along with personal financial and social transactions. He would list how much was spent on food, transportation and the dreaded property taxes. Milsaps used the bulk of his pension to purchase books and newspapers. He collected every War Cry published around the globe. He also collected S. A. books, pamphlets and kept a copy of every letter he wrote to Headquarters and other Army officials. His collection of posters has never been accessed by Army historians and collectors until recently. The posters are in good condition and the variety of them is amazing. Milsaps donated all of his materials (diaries and thousands of books) to the Houston Public Library. He began donating after 1900 and continued to until he died in 1932, allowing the library to build their collection around his donation. Today his diaries and materials are a fascinating insight into a man and his involvement with The S. A., along with the growth and expansion of the Army, especially in the West. The Major died in 1932 and is buried in his hometown, Houston. But his memory lives on through his writings and collections, a wonderful tribute to a not so well known Army pioneer. It is always a pleasure to hear the memories of Salvationist friends and Jim kindly sent us some recollections which appear here. “You ask about my background, shall we have an "abridged version" to begin with? You see I have a good memory, in fact I can vaguely remember as far back as 1933, I was three years old. Born in Ashton-under-Lyne 1930 we belonged to the Army there, my Dad was in the band playing BBb and he was a good player. Everything was wonderful, and life centred round the S.A. Of course there were special events: Christmas, Harvest Festivals and one of the most important of all were the Whit Walks when all the Sunday Schools walked in procession around the town. What a day that was !! Non Conformists in the morning to be followed by the Catholic Church. The C.of E. in the afternoon. Every Church Sunday School hired a Band (Brass) so with the Bands playing and the Church bells ringing the excitement was tense. We had Divisional events and Manchester was a very big Division in those days. I do not remember but I understand we had Major (later Col.) Mary Booth as D.C. Major Edgar Grinstead was another DC, he became British Commissioner. Yes indeed everything was wonderful, we sometimes went shopping to Manchester, sometimes by train other times by tram. I liked the train but it was a long walk from M/C Vict. Station to Piccadilly, so perhaps the trams were better, that is if it was an Ashton Corporation tram rather than a Manchester one. Guess why. The Manchester ones sometimes had wooden seats and the vibrations tickled when you sat on them!! Yes it was wonderful until the 3rd Sept 1939, and my world was never quite the same after. To begin with things were rather quiet, but one week before Christmas my father was knocked down by a bus during the blackout and died a fortnight later on 31st December. Mother then was responsible for my upbringing, and there was no Social Security then, so Mother went out to work in the cotton mill as a winder. It was hard work, 7 a.m. till 5-30p.m. and Sat morning. We attended the Meetings on Sunday, I was a Junior Soldier, in the Y.P. Band & Singing Company. (Have you ever thought about the terms and titles we use: Singing Coy. Songsters) and as the year wore on the air raid started. Ashton-under-Lyne is only six miles east of Manchester, so the Blitz cause some hair raising moments. One night I was wakened by my bed shaking, so I went into Mother’s room & wakened her thinking that there was an air raid, but the sirens had not sounded. (That was an awful sound, it made me feel quite ill) but what about this ""Air raid"". Nothing, perfect silence, I was12yrs old then and in charge of everything, so went to the road outside and asked an Air Raid Warden what had happened, but he told me to go back indoors. Next morning we were told there had been an earth tremor, so that was that. Another night we heard the sound of planes but as yet no siren. I cannot remember if we heard the explosion but in fact it was a Doodle Bug that exploded in Oldham just a few miles away, and after that we had quite a few of those wretched things. After the war I was traveling in Germany by train. We had to change at Pforseim (spelling may not be correct) a young man said that the town had been bombed, there was no unpleasantness but he made his point. "Yes" I replied "So was Coventry" Just then the train came. And maybe that could be for another "chapter". 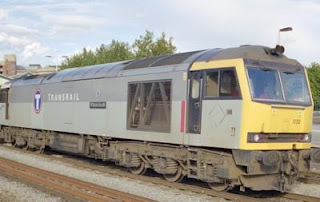 The William Booth is one of 100 Class 60 diesel locomotives that came into service with British Rail in the late 1980's and early 1990's. The original allocation was for 35 locomotives for Coal,25 to Construction, 22 to Metals and 18 for Petroleum. It is believed that the William Booth was allocated to coal haulage. The locomotive was named at a ceremony at Nottingham Station on the 3rd. November 1990. The William Booth was at times used in passenger service. On the 26th May 1991, along with 60057, it worked the first double-headed passenger train for the class. Both locos were on the 08.30 St. Pancras – Coalville ‘Coalville Salute’ rail tour for the open day. The pair then worked the Caolville – Nuneaton leg of the 22.00 Ayr – Bristol ‘Coal Scuttler’ tour, before working the ‘Caolville Salute’ back to St. Pancras (15:20 ex-Calville). On the 6th June 1994, the William Booth went to the aid of the 1E37 14:30 Paignton - Newcastle HST, which had suffered a major mechanical failure on the Lickey Incline. Unable to move it at first, progress was finally made, only for the emergency coupling to break. New Street was eventually reached by which time the HST was eight hours late. The livery of the locomotive was changed when the railways were privatised, and the William Booth now bears the grey livery of Transrail. The nameplate and Salvation Army Crest are still born by the locomotive which can still be found hauling freight around the country. As part of our aim is to support the Heritage Centres, we can fully recommend visits to them. The SAHPA also has a supply of membership forms for those Territories with Historical Societies. For newsletters, Eastern Territory USA produces a very readable quarterly report. Australia Southern Territory Archives and Museum’s newsletter is not only informative but also perhaps the most colourful of those we have seen. Australia Eastern Historical Society’s publication is entitled Under the Tricolour and Canada and Bermuda Territory’s The Crest – both make excellent reading. With permission we reprint an article from the latter’s Spring 2005 edition. The August 1900 first week edition of the War Cry carried a full page account of the promotion to glory of George A.C. Wiggins with the heading " Synopsis of the Career and promotion to Glory of our Glorified Comrade the Late Professor Wiggins." "He is going to take me," were the last words which our dear departed brother, Professor Wiggins intelligently uttered before his now-glorified spirit had flitted from its' house of clay' to be forever with the Lord. Thus was the last testimony given by G.A.C Wiggins one of the outstanding contributors to the world of Salvation Army music in the early days of the Salvation Army, Canada and Bermuda Territory. When it came to matters musical Wiggins was a master. Prior to his Salvation Army involvement not only was he a leading church organist but he was also a highly regarded music teacher. His music career began early in life, having played before Queen Victoria shortly after his sixth birthday. His early aptitude for music opened up an opportunity as an instructor of music in the British army. He traveled with the army and eventually ended up in Fredericton N.B. where he was discharged on medical grounds. He then went back to England and enrolled in the Royal Academy of Music in London, where he received his degree and remained as a teacher for one year. Coming back to Canada he took a position in the Collegiate Institute of Whitby where he was recognized as one of the professors of that institution. However, the professor had a serious weakness in his character. He was a slave to alcohol. For 25 years whiskey had been gradually gaining mastery over this talented musician. In time it had such control over him that he would turn up in a drunken state for service in the local church where he was choirmaster and organist. When Professor Wiggins heard the Salvationists on the street corner in Whitby he began to think that the Judgment Day was drawing nigh, and that it was high time he had quit the one unfortunate habit of his life and that which was destroying him- the drink. He listened to the Army on the street two or three times and then followed them to the barracks and there sought and found salvation. A transformation took place immediately. He became a soldier, and a year or so later applied for officership. He was accepted and was appointed to Cobourg corps. The soldiers of Cobourg Corps were proud to have as their corps officer, not Captain Wiggins, but, as he was better known, Captain Professor Wiggins. "Forward soldiers, marching on to war, Step out boldly, keep the foe in view; We shall conquer, for we know we are True Blood and Fire soldiers of the King of Kings." Following a brief career as a corps officer the professor captain was appointed to territorial headquarters staff where he was involved in the music of the territory. He traveled throughout the territory making and singing Salvation Army music and songs and telling what Christ had done for him through the Army's instrumentality. He was a prolific writer of songs. In 1888 a booklet of his songs titled "New and Original Songs" composed by Professor George A. C. Wiggins, B.A. was published by Commissioner T. B. Coombs. Another booklet of songs was published in 1887. Songs such as "Come Away To Calvary"," There's A War To Wage", and " I'm Saved and Fully Trusting" were just a few of his compositions. He represented the Canada and Bermuda Territory at the Crystal Palace in London, England during the Triennial Congress in l890. Writing to his wife from the Congress Hall, Clapton, London, England he said: "I cannot describe to you the grandeur of the processions and meetings at the Crystal Palace. I trembled and cried with delight. About one hundred and thirty thousand people present, 5200 officers among them, every country represented; 1,000 bandsmen -1 played on the piano at the palace, 800 out to the penitent form." A talented musician and soldier of Jesus Christ, upon being suddenly promoted to glory was given an impressive service in the Lippincott barracks, where he loved to come and "sing and pray and play for Jesus" as he used to say. He was given a soldier's funeral, his body being laid in Mount Pleasant Cemetery, on Tuesday June 19th 1900. Private Collectors, Blessing or Bane? The following paper was submitted by David Miller to the 4th Australasian Tri-Territorial Heritage Conference May 2004, Melbourne, Australia. Well, I have to admit that in my 55 years I've probably been called a bane a lot more often than I have been referred to as a blessing. What I don't quite understand is why should being a private collector of Salvation Army memorabilia make me a bane to anyone? What is it about my hobby that anyone should seek to label me as a bane? All of the material in my collection is honestly obtained from legitimate sources and I collect for pleasure not profit. So why should I be referred to as a bane? I have had it said to me that private collectors prevent official Salvation Army Heritage Centres and museums from obtaining items for their exhibitions. This I find a very hard pill to swallow. Firstly most of the items that are in the hands of private collectors would not be wanted by a Heritage Centre as they would not be of sufficient historical importance. Secondly many of the items started off as being either the property of The Salvation Army or of a Salvation Army Soldier. Before anyone starts criticising private collectors maybe it would be wise to consider where dealers who sell to private collectors obtain the items. For example, our local corps was moving premises and hired a skip to clear the old hall. Knowing from past experience what was likely to happen, I contacted the CO and asked if I might have a look through the so called rubbish before it was consigned to the tip. Captain readily agreed, after all it was going to the tip that afternoon. What a sight greeted me when I arrived. Old S.A. instruments, song books, a print of the founder, just to name a few of the items that were headed for the dump to be seen no more! Even the black garbage sacks yielded many items of interest to collectors. Despite the fact that Captain was prepared to give me the items, I did a quick calculation and told her that they were worth over £1,000 on the open market and that I was prepared to sell them with all proceeds going to the corps. In fact we raised over £1,500, a more than useful addition to corps funds and certainly a good result for a skip full of rubbish! At one time I was approached by a Salvation Army Charity shop and asked if I was interested in S.A. items as they had no market for them. Records, books, china etc. were being dumped as worthless. Even records of the Founder's voice had been consigned to oblivion! A steady supply of items ensued. Nothing that special, but collectors would certainly be interested. Another successful 'rescue' operation and another nice addition to corps funds. Why are these two examples so relevant? All the items in question were once in the possession of members of the Salvation Army. Were they offered to a Heritage Centre? Or archived within the corps? No! they were on their way to a land fill site to be seen no more! Who prevented this happening? A private collector! At least now these pieces are in the possession of people who will preserve, research and care for them. These are not isolated instances, I know many private collectors who could relate similar stories. What is it about some Salvationists that they seem to show so little interest in the heritage of the great Army to which they belong? As some will know I own a web site, http://www.sacollectables.com/, which seeks to bring together collectors of Salvation Army memorabilia. What you may be surprised to learn is that I have a mailing list of over 800 collectors throughout the world. I know of many more who do not have access to the internet so are not included in this figure. Private collectors exist and are not going to go away. The question surely must be do official Heritage Centres and museums work with them, or merely complain about their existence? The official collections cannot hope to archive every single piece of Salvation Army memorabilia, although I'm sure that there a few pieces in private hands that they would like to have. The answer is very simple. Work with private collectors. Ask them for pieces from their collection to be made available on loan to the official exhibitions. I would certainly co-operate, and I know that most if not all of my fellow collectors would do the same. If this idea appeals I would be prepared to make my web site available as a place where Heritage Centres can track down specific items they would like to add to their displays. I often hear that the official Heritage Centres and museums are short of money. If this is the case let's get together and set about raising some funds for this important work. My web site will certainly help, and I'm sure my friends at the Salvation Army Philatelic Circle, the Christian Mission Historical Association and the Salvation Army Regal 78 Association would also lend their support. Maybe private collectors would be prepared to donate a piece or two to be sold to raise some funds. There must be a wealth of items of interest to collectors languishing in Corps throughout the world that hasn't seen the light of day for decades. What a cash injection that could provide if it could be harnessed. The way forward must be through working together. If we allow an 'us' and 'them' attitude to develop then not only do we all lose, but so do future generations who are yet to be inspired by what the Salvation Army has achieved. Our aims and objectives are certainly not dissimilar, co-operation is the only sensible way forward. The International Heritage Centre in London is a veritable mine of information for Salvation Army collectors and historians. All queries and information requests are dealt with promptly and in great detail. In my humble opinion it is the way it should work. The more people that become interested the better chance we all have of preserving artefacts and memorabilia to inspire future generations to continue the wonderful work of the Army we all love. In the past I have been criticised for the ever increasing interest in Salvation Army memorabilia and for the increased prices of items. As far as prices are concerned that's down to what the individual is prepared to pay. The market obviously decides its' own level. Personally I think some of the prices paid are scandalous, but who am I to criticise others? What I do know is that with the wealth of new collectors there is more Salvation Army memorabilia being preserved and cared for than ever before, and if I stand accused of being a part of that then I plead guilty as charged and await my sentence! Are private collectors a blessing or a bane? I believe that it is, to a large extent, down to the way the official Heritage Centres wish to view them. We stand ready to work with you, but unless you allow us that privilege then I fear that it will never be. I pray that out of your discussions and deliberations will come a desire that we can all continue to be inspired by our collections, and that in a spirit of co-operation and mutual respect we can work together to attain our objectives. Harry was not only a life-long Salvationist but also an inspiration to thousands of people in and out of the Army world. Born in Batley, the youngest of nine children, Harry’s family were regular worshippers at the Parish Church and the children attended the Parish school. Harry’s father was a boot repairer and had a small wooden hut opposite one of the mills in Batley so there was no shortage of customers. At the age of 9 Harry was diagnosed with spinal TB and spent the five years from 1934 to 1939 being treated in hospital and enduring major orthopedic surgery. One operation at Leeds General Infirmary in particular was pioneering and consisted of bone being taken from his legs and used to replace diseased bones in the spine. Every year for a long time afterwards Harry used to ring the surgeon responsible to thank him – truly a measure of Harry’s thoughtfulness. Upon leaving hospital in time for his 14th birthday, Harry was determined to do well in the world of work. He committed himself to self-study at evening-classes learning clerical skills and rose to become Accounts Manager at the Yorkshire Post. Just stating this hardly does credit to Harry’s work ethic. After leaving the Yorkshire Post Harry started his own business as a Philatelic Bookseller and Publisher and what a success he made of this. As well as editing, he wrote a number of the books himself and his works are rightly regarded as definitive on the various philatelic subjects he wrote on. Harry also had a tremendous eye for detail and I well remember him discussing with a number of collectors such topics as the difference between the Sun Alliance and Salvation Army perfins! It was this philatelic business that taught and inspired thousands of people and Harry was certainly a tireless worker. Readers will be interested to learn that Harry’s love of philately came from his time in hospital where, upon learning of his nephew’s hospitalization, an uncle in Canada sent him a stamp album. Unfortunately, sometime later there was an infection at the hospital and Harry’s prized collection had to be destroyed. In terms of Salvation Army philately, Harry established the Salvation Army Philatelic Association with a worldwide membership. As well as the always eagerly awaited quarterly Journal, Harry organized Conventions and stamp sales. Ever encouraging and always honest in his opinions, Harry was the stalwart of the Association and many of us will remember the fellowship shared at our gatherings. Harry was delighted to see the Association merge with the Christian Mission Historical Association to become today the well respected SA Historical and Philatelic Association. 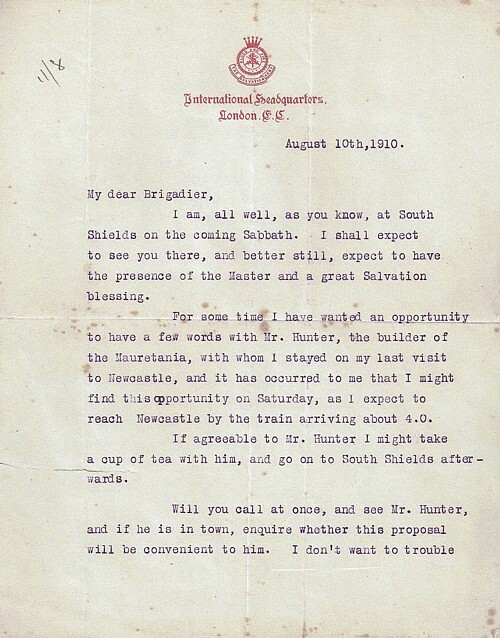 Harry was equally tireless in his Salvationist activities serving with great dedication at Batley and York. Soldier, bandsman, songster leader, Torchbearer youth group leader (where he met Stella and where, as a popular activity, so many young people met their future spouses) and Corps Treasurer for 30 years! Out of uniform Harry loved his garden and again many of us will remember his Christmas cards showing portions of his garden. Harry’s funeral service, led by Lt.-Col Ray Kirby, was held at York Citadel on 19th April. All of us will miss Harry greatly and send our love to Stella and his family. As a child, William McKenzie lived with his parents in a thatched cottage in a small Scottish town. When William was 15 years old the family emigrated to Queensland, Australia. His first contact with The Salvation Army occurred during a visit to Bundaberg, where he happened upon an open air meeting. After attending several meetings he felt the call of the Lord and committed himself to Salvation Army Officership. As an officer he found that fighting for God was not so simple as some might think. On at least one occasion he was imprisoned for preaching the gospel. In 1914, after 25 years service in The Salvation Army he was appointed as Military Chaplain. The following year he accompanied the Anzac Forces on the Gallipoli campaign. It was here he earned the nickname 'Fighting Mac'. Shunning concerns for his own safety, he often conducted services and funerals under enemy fire. When orders came to storm the Turkish trenches Mac was urged to return to safety. Despite this he was with the troops on their assault. Following service in Gallipoli he was appointed Chaplain to the 4th Battalion of The First Australian Infantry Brigade in Egypt. In 1917 Mac went with the AIF to France. He was with the Fighting Fourth - Pozieres, Bullecourt, Mouquet Farm, Passchendaele Ridge and on the Somme. Those in charge often feared for his safety but yet again Mac shunned their pleadings and would often accompany the men into battle. After three and a half years service with the troops a decree limiting overseas service of Chaplains recalled William McKenzie to Australia. He was accorded a grand farewell by the troops, complete with parade and military band music. At the Commanding Officer's invitation, Mac passed up and down the ranks shaking hands with every man. Attending Buckingham Palace at Royal Command, he received the Military Cross from King George V in recognition of his military service. General Bramwell Booth bestowed upon him the Order Of The Founder, marking memorable service that would have commended itself to the Army's Founder, William Booth. Australia gave Fighting Mac a tremendous welcome home. Great public gatherings were held in each state and a crowd of around 7000 greeted him at the Melbourne Exhibition. At the request of the N.S.W. Government, he spent 12 months on special service assisting with the repatriation of returned soldiers, travelling far and wide in the interests of his old comrades. An offer of a permanent position, which he refused, carried a salary of £2000.00 a year. In 1927 he was appointed to command The Salvation Army's work in China, where many of the Army's Australian Officers were serving as missionaries. Recalled to Australia in 1930, he was appointed Territorial Commander of The Australian Southern Territory. At the Generals wish he returned to China to carry out a series of spiritual campaigns in the land where he had once served. Similar work in Australia followed before Fighting Mac, his days of active service over, entered into retirement. As a fitting tribute to his many years of service given to others, he was awarded The Order Of The British Empire. The leading interviewer of one of Australia's newspapers paid him the following tribute. "There is no more picturesque personality or better loved man in Australia than Commissioner William McKenzie, M.C., of The Salvation Army - "Fighting Mac" to countless returned "Diggers”. My name is Jim Williams and I am a Soldier with the Salvation Army in Felixstowe. The Digital Archive was launched on January 1st, 2010 with 2033 images. This article is to explain the why and how the Archive came into being. Four years ago the Salvation Army, through their help and fellowship, helped me through a low point in my life and it was at this time I was reading an article in the War Cry prior to a meeting. The article related to a book by Dr Francis Collins, who headed up the team that decoded the human DNA. The book, ‘The Language of God’, describes how you can be a Scientist and have a faith and one line jumped out; ‘GOD OPERATES OUTSIDE NATURE’. It was like being hit by a truck. Before I assumed God was bounded by our physical laws of nature, but once I realized this wasn’t so anything became possible. I purchased the book and many of my questions were answered; since then I have been in communication with Dr Collins. I had been inviting Jesus into my life but frustratingly nothing happened. During a Small Group study, I asked Jesus into my life and on April 18th, 2007 at 11.28pm, I came to faith. I needed something to give back to the corps and as I cannot sing or play an instrument, I turned to my life long hobby of photography and latterly computing; with the culmination in 2010 being granted my Licentiateship by the Royal Photographic Society. The idea for the archive was born. The Archive has been based on the late Charlotte Horridge’s Pictorial History’ and ‘Focus’ our bi-annual in-house magazine. Many of the photographs were taken by Stan Cracknell, the Corps Photographer, who also looks after all the earlier pictures. Stan also provided information about the photographs, along with Bernard Rayner who also edited the book and the magazines. It has taken took 18 months to digitally transfer all the images and to add the narrative. The strength of the Archive lies in its search facility and the images can be located by name, location, event, date etc. With Stan suffering from health problems, I have taken many of the images over the last few years. For the technically minded all the images are imported into ‘Lightroom’ where all the manipulations are carried out. The images are renamed and full size jpeg images are exported to 2 external drives as back up and low resolution images are exported to a designated file. A FTP file is then used to transfer the images into the Archive where they are transferred into the correct Albums and the narrative for each images is added. Currently we have 3614 images that have been viewed 68632 times from 50 countries with images being added weekly. If anybody has any questions about the Archive, I can be contacted at jim@felixsa.org.uk . The Archive can be viewed at http://www.felixsa.org.uk/ and I would appreciate any feedback. Here we go again, yet another attempt to deceive the SA philatelist. This one is so blatant I just cannot believe that it would deceive anyone! It appears, yet again, to emanate from Australia and has probably never even seen the UK, let alone a post office. There are a number of these covers around, differing only by which General is depicted, ranging from William Booth to John Larsson. I found them all on Ebay being sold as genuine commemorative covers. Let’s look at the different elements of the cover. Printing quality is very poor suggesting that it was probably printed on a cheap inkjet printer or something similar. The way the elements of the cachet are overlapped causing fade out and blur says little for the graphic ability of the producer. Should really read label. This was not authorized by the Royal Mail, and it is illegal to produce privately stamps which purport to be for postage. This label definitely falls into that category as it is inscribed ”LOCAL POST”, a term never used by Royal Mail. Printing quality is again poor. The postmark was not produced or authorized by Royal Mail. It was probably copied from another cover with the date etc. being changed by the use of PC software. I also have severe doubts that the postmark was even applied by normal means as it appears to have been printed on an inkjet printer. Royal Mail will not postmark commemorative covers that do not bear the correct postage rate; therefore the postmark on this cover is most definitely a fake. I can only assume that covers such as these are produced by those who will try anything for a buck! Let me tell them that this is dishonest at best and a crime at worst. For goodness sake, stop producing this rubbish, and above all stop deceiving honest collectors. To my fellow collectors, please do not buy this trash. The more that these producers sell the more they will produce. There are plenty of good genuine covers and stamps available on the open market without sullying your collection with rubbish from these scammers. The first Dutch Headquarters Songster Brigade was formed in 1905, to provide musical support during meetings led by Commissioner Estill. The Songster Leader, Major Bondam, was the Editor of the Dutch Musical Salvationist, the first edition of which was published in the same year. Disbanded in 1906, they were reformed by Commissioner Whatmore in November 1916 under the leadership of Staff Captain J. P. Rowle, a former Amsterdam Staff Bandmaster. However, again the section quickly disbanded and remained in-operative until 1923, when Major Ronitz was appointed as Executive Officer and Lieutenant Gerrit Claeijs as Songster Leader. Gerrit Claeijs was born in 1888. His parents were soldiers at the Hague I Corps but as a young man he did not care much for the Army, which his parents had joined. He started working in a Christian bookshop after his father died and became interested in the Army when he attended a festival given by the International Staff Band during their 1907 visit to the Netherlands. 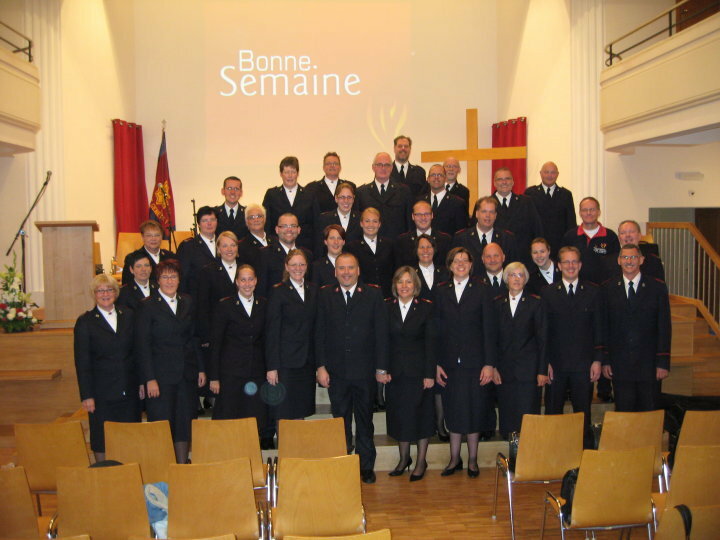 So impressed was Claeijs by the Band and its music that he started to attend meetings on a regular basis and after hearing Staff Captain Brouwer describing his work in the Netherlands-East-Indies made the decision to become a Salvationist. He became Songster Leader of the Hague I Corps, which was situated opposite the bookshop where he worked. Claeijs entered training in 1921 and his first appointment was as translator to Commissioner Howard and subsequently as secretary to Commissioner Povlsen, who recognised Gerrit's musical abilities by appointing him as Leader of the Headquarters' Songster Brigade. This group supported Commissioner Povlsen in festivals, campaigns and congresses throughout Holland and also made several records on the Odeon label. In 1926 Gerrit Claeijs married Lt. Nelly van Nith. This was a practical partnership, husband composing melodies for which his wife wrote the words and many of these songs were first performed by the Headquarters' Songster Brigade. Claeijs also translated songs from The Musical Salvationist issued in English by International Headquarters. The Claeijs served as Corps Officers until 1931, when Gerrit was appointed to the Dutch National Headquarters as Head of the Music Department. He continued to lead the Songsters until they were disbanded around 1940. 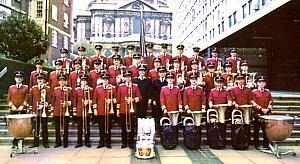 In May 1956 the Netherlands National Songster Brigade was re-formed by Bernard Verkaaik; this group is known today as the Amsterdam Staff Songsters. Count Rumford had abolished beggary in Bavaria in the late eighteenth century, and his ideas had again become popular in the 1880s. As an American loyal to the Crown, he had served in the British Army "with considerable distinction in the Revolutionary War," according to Booth. After the war, he settled in England and then moved to Bavaria to reform its army. While there he set up Houses of Industry in which, be-ginning on New Year's Eve 1790, he compelled beggars to work. He discovered that when he treated them with justice and kindness, offered clean and orderly surroundings, and provided inexpensive provisions, they responded with hard work. Best of all for Booth and cost-conscious Victorians, Rumford's program was self-sufficient. A military approach to unemployment, vice, and poverty impressed Booth, who agreed with Rumford that the poor needed direction from a strong hand. Like the Count, Booth would organize workers "not as a bewildered, bewildering mob, but as a firm regimented mass, with real captains over them." Booth's city colony workshops reflected Rumford's Munich workhouses, and, like Rumford, his autocratic leadership was thoroughly military. E. T. Craig was an aged Robert Owen disciple who set up an agricultural cooperative experiment at Ralahine, Ireland, in 1831. With support from John Scott Vandeleur, a wealthy Irish landowner, Craig had induced unruly Irish peasants to increase production and improve living standards. Profit, after rent, belonged to the peasants. Craig, as would Booth, permitted no intoxicating drink or tobacco. Unfortunately, gambling by estate-owner Vandeleur led to the 1833 closing of Ralahine. When Booth established his farm colonies, he followed the Ralahine format (even though he was no ideological descendant of secularist Robert Owen). The Earl of Meath was president of a rival social-evangelical organization, the Church Army, founded by the Church of England in 1882 as a Salvation Army clone. At the time, the Church was negotiating with Booth to merge his Army with the established church as its evangelistic arm. In early 1889, a year before he published Darkest England, Booth acknowledged that Meath's pamphlet on poverty expressed his own notions on individual responsibility exactly. Booth, for example, had opened a second self-supporting men's shelter, in Clerkenwell. Men paid three pence for supper, a "homely talk on salvation," and bed and breakfast. Unlike common lodging houses, Salvation Army shelters were free from "vile, demoralizing associations." Booth said theArmy did not encourage "soupers"; he would do nothing for a man "on condition that he did something religious in return." Meath also contributed to Booth's ideas for the second and third phases of the Darkest England scheme, English and overseas farm colonies. Meath had pressed for state-directed colonization of the unemployed in "Greater Britain" in 1886. 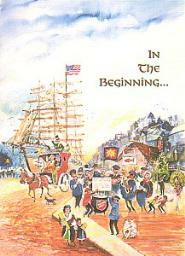 In 1890, Booth offered to become the state's agent in selecting, preparing, and transporting poor but willing settlers for relocation in Britain's overseas empire. Booth echoed Meath's concern that the dominions would not accept London's vicious paupers, and he agreed that prior training on an English farm colony could improve work habits and character and make paupers acceptable for emigration. He followed Meath's prescription for successful emigrants: (1) character was more important than agricultural training; the government's program had failed be-cause it had not followed this plan; and (2) children could be trained on model farms in England to be apprenticed to colonial farmers. Meath resented Booth's use of his plan. His Church Army accused Booth of stealing social reform ideas from a pamphlet, "Our Tramps," published in March 1890. The pamphlet proposed a three-fold scheme of city, farm, and overseas colonies. Booth could have charged this alleged theft as repayment for the Church Army's theft of his idea for militant evangelism as well as his hymns. Nonetheless, Meath wanted Booth to acknowledge his sources for Darkest England. He wrote in 1904 that a "great religious Nonconformist leader"—almost certainly Booth— had not mentioned twenty-two German labour colonies in existence in 1890. Was this due to ignorance or to a desire to "claim credit for an idea which was not novel?" Meath’s barb is an example of principled jealousy. Booth often found that the clergy, labour union leaders, social workers, and philanthropists were his strongest foes in religious and social reform. As a boy, Robert Meredith Reinger played the drum with the local Salvation Army Band in his home town of Mason City, Iowa. He later attended the Juilliard School in New York, where he studied flute and piccolo. On marriage to his childhood sweetheart, Peggy Wilson, he adopted her surname, which he used throughout his professional career. He was a member of John Philip Sousa's Band, The New York Philharmonic Orchestra and later a musical director for the NBC network in Hollywood. During the Second World War, Wilson served as a Major, operating the Armed Forces Radio Service returning to NBC upon de-mobilisation. 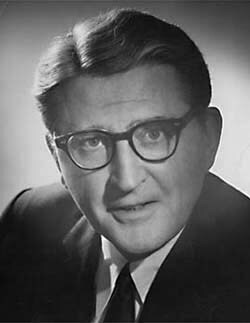 In addition to his work for NBC, Meredith Wilson composed orchestral and chamber works including two symphonies, film scores, popular songs such as It's beginning to look a lot like Christmas and musicals. The best known of these, The Music Man, opened on Broadway in 1957, winning a "Tony" award for best musical and the first "Grammy" award for best cast album. It has been adapted twice for film (1962 and 2003). Meredith Wilson attended a commissioning of Salvation Army Officers in San Francisco, where the words of the Cadets pledge; "to love the unloved" and "seek the lost" stirred him deeply. Years later, in New York, he heard a distant drum beat and turned to see another group of smartly uniformed Cadets with their colourful banners marching to Sunday meetings. The words of the Cadet's pledge again rang in Wilson's ears and from this experience came his tribute to the Salvation Army, the song Banners and Bonnets which aired on NBC's Big Show in 1952. Subsequently a recording, featuring the American female vocalist Eugenie Baird, was made and samples sent to radio stations throughout the USA. No commercial copies were issued. The record is unusual in that it is a ten inch, 78 rpm, vinyl. 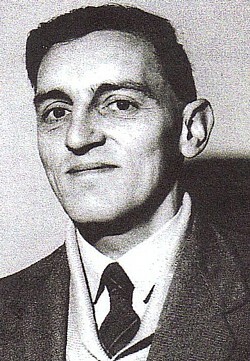 Brigadier Richard Holz, who was for many years head of the USA Eastern Music Department and Bandmaster of the New York Staff Band (NYSB), obtained permission from Meredith Wilson to arrange and publish the song for Salvation Army use and it was featured by the NYSB during their 1962 tour of Great Britain, with Major Olof Lundgren as soloist. The arrangement later appeared in the General Series Band Journal and became the signature tune of the BBC's Banners and Bonnets radio show, which aired on Sunday Mornings during the 1970's.